Massa defined this field with their advanced innovation. Presently Massa develops and manufactures a wide variety of transducers and systems for use specifically by the oceanographic community. Our customers include major universities, institutions, and commercial companies. Massa Sub-Bottom Profiling transducers are well known in the hydrographic survey industry for durability, performance and reliability. 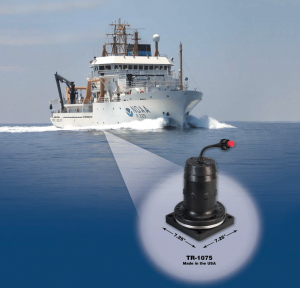 For instance, Massa’s TR-1075 Sub-Bottom Transducers are used by survey vessels to map the sediment layers of the ocean floor. These sub-bottom surveys are needed for oceanic cable/pipe burial operations, locating structures and exploration for oil and gas. Listed below are a few of our many oceanographic transducers and connectors. If you have a specialized application, Massa can quickly develop a Customized Solution, often by leveraging our large design portfolio. If you have a specialized application, Massa can quickly develop a Customized Solution, often by leveraging our large design portfolio. Who better to develop a new product for your application than the people who developed the industry?